Comet C/2014 Q2 Lovejoy and Targets for the coming weeks. Right, let's get straight to it. Observing opportunities for me since returning to work after the Christmas break have been quite minimal. In truth, I haven't had the scope out at all. However, I have been outside looking up with the camera. It's a well known fact that astrophotography can be very expensive. But, there are plenty of websites and guides out there that show you how to achieve acceptable results with little more that a standard DSLR, un-modded and without any special lens kits. So, I thought I would give it a go. I found this website an extremely useful place to start with DSLR astrophotography. As well as explaining the principles of photography, the YouTube channel also gives good demonstrations on how to achieve results. So, to my efforts. Well, I've learnt two things. It takes patience and practice. My first attempts were of something simple, and naked eye. I chose the Pleiades cluster, and did manage to produce an image which for a first go was OK, but not brilliant. Recently, Comet 2014/Q2 Lovejoy has been in the news, and with my Twitter feed going nuts with people reporting naked eye visibility of the comet last night, I decided to go out with the binoculars to try and find it. I did manage to locate it, and made out a green hue with a somewhat brighter core. Conditions for viewing from the back garden were pretty poor. Very windy with high level cloud whipping across the sky. So, after a few minutes of looking at the comet, I came back inside. Later in the evening, around 10pm, the seeing conditions improved a little with not so much cloud. So, I decided to get the camera and tripod out to attempt to capture some frames of the comet. I would have like to have tried using prime focus photography with the scope, but I didn't have the time to set it all up. Instead, I used the 55mm lens kit and took a series of frames at ISO 6400, with second exposures and f/5.6 all shot in RAW format. I added some flats and biases before returning indoors for a warm. I was a bit disappointed I couldn't spend more time getting the extra data, but took what I could. Returning back indoors and to the computer, it was time to see the results. I wasn't expecting anything spectacular as I was using quite a wide angled lens, so nothing close up. I chose my 5 best scoring lights, added 1 bias and 1 flat and run them through Deep Sky Stacker. I am pleased to say that I did capture the comet, although initially it looks like any other star. But, when I zoomed in on the object, I could make out the green hue to confirm it was the comet. My post processing skills aren't up to much, but I dare say that with some knowledge I might be able to bring the colour out better. The first image is a screen print from the Stellarium application that I used to confirm the location of the target at 22:00 UK time on the 10th January 2015. The second image is a cropped area of the final stacked photo. 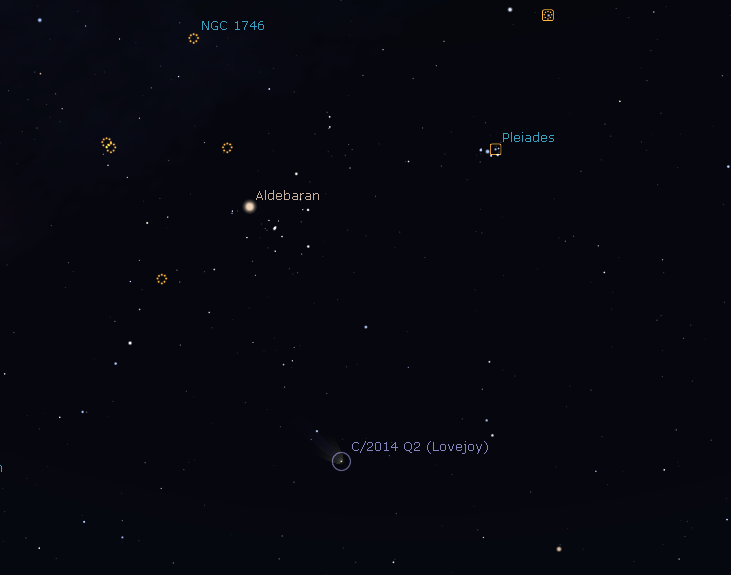 Stellarium screenshot showing the location of C/2014 Q2 Lovejoy in relation to the "V" shape of stars in Taurus, and the Pleiades. Stacked image. 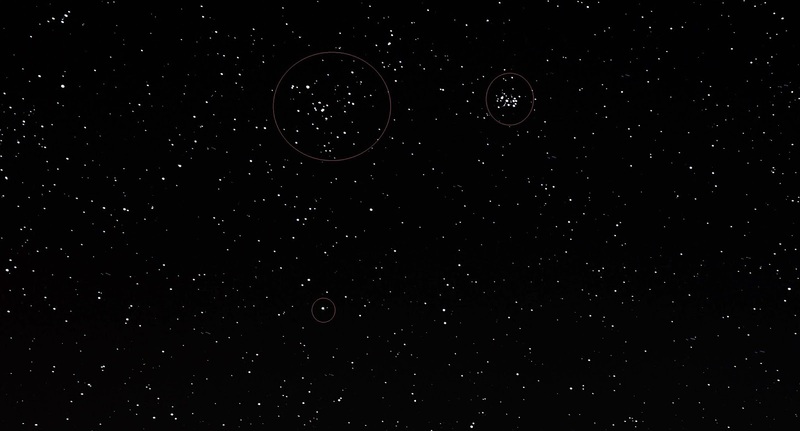 Large circle shows part of the "V" shape in the constellation in Taurus. The circle to the right is around the Pleiades. The small circle at the bottom of the image shows the target Comet C/2014 Q2 Lovejoy. Zoomed in are of the comet. In the image above, I zoomed into and cropped the area of the comet. This was from a black and white image, so colour is absent. However, the comet in the centre of frame isn't quite as sharply focused as the surrounding stars. So, there you go. Nothing amazing, but for a quick stab in the dark, it was OK. Finally, these are some of the easy objects that I want to spend some time observing or perhaps imaging in the coming weeks. As and when conditions and time permits, I'll give them a go, along with some work on the longer term tick lists. Comet Lovejoy. Got to love the Lovejoy at the moment! It's going to rise steadily in the sky in the coming couple of weeks. As with all comets, sometimes they can fade, sometimes they can brighten so we will see what sort of display it puts on for us. Orion. By 10pm, it has risen sufficiently in the sky for me to get some good views of the constellation. The Great Nebula in Orion is a firm favorite of many astronomers and a common first target for astrophotographers. It's a binocular object, and when conditions permit, a naked eye one too. I would like to try the 200mm DSLR lens kit on the nebula and see what happens! Jupiter. Again, by 10pm Jupiter is shining bright and high in the sky. It's going to be around for a while yet and will undoubtedly be visited many times. However, not a photo target for me, but definitely one for the 5mm EP in the scope! Venus. One for people not wanting to wait up until the darkest throws of the night. This week, Venus can be spotted shining brightly just above the South West horizon around sunset.